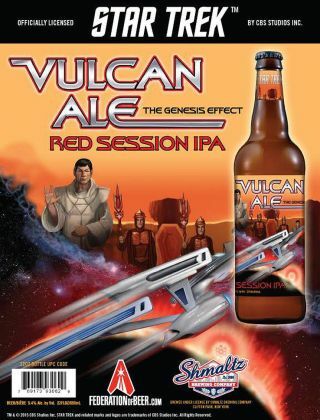 Vulcan Ale, a beer inspired by Star Trek, has made its way to the United States. BROOKLYN, N.Y. — Even a veteran Starfleet officer would have a hard time turning down a pint of Vulcan Ale, a new "Star Trek"-inspired IPA perfect for a crisp autumn night of stargazing. In "The Conscience of the King," the 13th episode of the original series of "Star Trek," Dr. McCoy asks Mr. Spock if he'd care for a drink. "My father's race was spared the dubious benefits of alcohol," the stoic half-Vulcan replies. But perhaps he would make a rare exception for Vulcan Ale, the latest "Star Trek"-themed Federation of Beer collaboration. The author poses with Vulcan Ale during a launch party on Oct. 5. When I asked Raincock why he wanted to create Vulcan Ale, he simply responded, "It was logical," in true Vulcan fashion. While brewing, distributing and consuming beer is not exactly the same thing as exploring the galaxy in a starship, Raincock still saw some similarities between the two. For both enterprises, you need courage, curiosity and good friends backing you up, he said. Vulcan Ale — the Genesis Effect is a red IPA, and as such, it's a fairly hoppy beer. (Appropriately enough, some of the hops included in the brew are called Galaxy, Warrior and Comet.) However, the hops are not overwhelming, and it has a rich, slightly sweet flavor underneath. Like most red ales, The Genesis Effect has a full body but feels surprisingly drinkable, even to this Starfleet cadet's lager-seasoned palate. The only part of the beer that I didn't find pleasant was the aftertaste — more flowery hops, although this will be a plus rather than a minus to the IPA crowd. I also spoke with Andy Heidel, owner of The Way Station, who eagerly volunteered his space for the beer's U.S. debut. "We have the best collection of nerds in the tristate area," he said, gesturing to the packed bar full of costumed patrons watching (and quoting) "Star Trek II: The Wrath of Khan." "We all grew up with Star Trek in one form or another," he said. I pointed to the TARDIS-shaped bathroom in the back and asked whether Heidel himself prefers "Star Trek" or "Doctor Who." "They're entirely different animals," he replied with Sarek-like diplomacy. 'Doctor Who' is fantasy-set in a sci-fi world. Star Trek is pure sci-fi."